Sea Containers was the redevelopment of a prominent building on the south bank of the River Thames sitting in 0.75 hectares with a frontage to the River Thames of 122m. The project involved the refurbishment of an existing concrete frame building and the construction of a new 9 commercial building with basement on the South Bank of the River Thames. The refurbished building is designed to a 358 key hotel and 28500 sqm of commercial space; the new building is designed to provide 6250 sqm category A office space to replace the area taken by the hotel. The refurbishment included retaining the existing façade which is precast concrete. Extensive investigations were carried out on the existing precast cladding which allowed it to be re-used saving a considerable sum of money, programme and sustainability credits. New triple and double glazed glass units were installed within the existing cladding apertures which allowed the building to be more sustainable in terms of heat loss and gain. 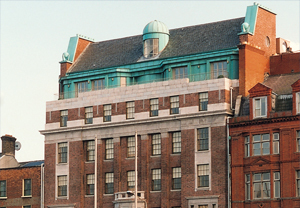 The refurbishment of the existing building included the removal of the cellular structural walls that originally formed the walls for the hotel rooms. By inserting steel structural steel into the existing concrete frame allowed structural walls to be removed opening up the floor space to be suitable for modern office use. The decision to cut back the internal structural walls allowed the re-use of the existing structure in lieu of full demolition. The superstructure to the new build office was designed for rapid construction and comprised a structural steel frame with composite metal deck concrete slabs and a slip formed core. This allowed for offsite prefabrication for the structural frame, a key driver on a constrained site. The perimeter cladding followed the same principle and was designed and constructed with unitised cladding panels comprising of precast concrete with polished reconstituted stone cladding and glazing. The development of Sea Containers House could have been so different. The existing building constraints of floor to floor heights, deep floor plates and structural cellular walls suggested that demolition was the only option to bring the clients asset up to modern standards and rental opportunity. 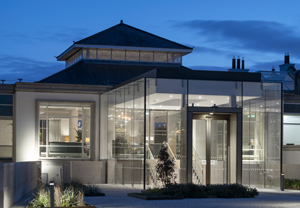 However, the vision of the client and design team and their determination to work within the existing building constraints lead to a successful project where the building was let before practical completion. The whole team including the main contractor worked together to allow the removal of the internal structural walls to provide an open plan office space. 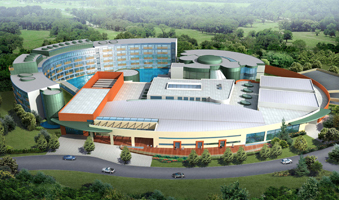 Close collaboration of the design team initially, then early involvement of the main contractor assisting with the co­ ordination of all the disciplines. The building was designed with sustainability as a key objective and achieved BREEAM excellent for the office and BREEAM Very Good for the Hotel refurbishment. 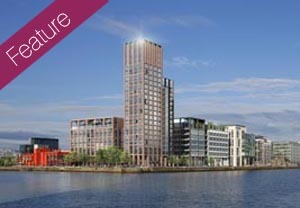 Capital Dock is strategically located in the heart of Dublin’s south docklands on one of the largest undeveloped waterfront sites in the capital.